Softcover, 10 1/4 in. x 8 1/2 in. Few sports-racing cars have captured the imagination as did the Chaparrals, menacing white machines out of the Texas oil country that cut a swathe through American sports-car racing in the 1960s and even won at the Nürburgring and Brands Hatch. Created by Jim Hall and Hap Sharp, with the help of GM and Chevrolet, the Chaparrals pioneered such innovations in racing as the wing for aerodynamic downforce and the automatic transmission. Great photos from the Ludvigsen Library by Karl Ludvigsen, Stanley Rosenthall and Max Le Grand show the exotic Chaparrals at rest and in action, including the first front-engined cars, the 2, 2C, 2E and 2G sports-racers, the 2D and 2F endurance-racing cars, and the wildest of all, the 2H and 2J?the first car to use a fan to generate suction downforce. 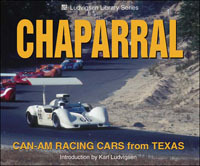 The book is a rare treat for fans of the exciting and popular Can-Am racing series.